Butler High School senior Will Long, left, has been named a National Merit Scholar Semifinalist. He is pictured with Principal Tom Luebbe. 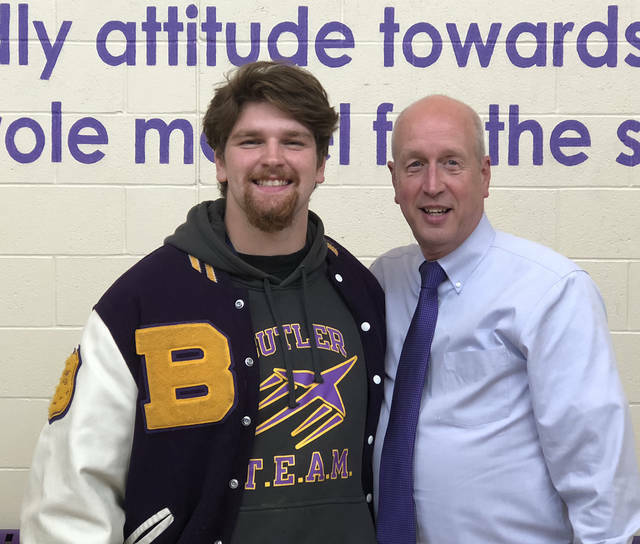 VANDALIA — Butler High School Senior Will Long has been named a National Merit Scholar semifinalist. As a Semifinalist, Long has the opportunity to continue in the competition for to earn one of 7500 National Merit Scholarships, worth more than $32 million. As a junior Long scored 1,480 out of a possible 1,520 on the PSAT test which serves as a qualifying test for the National Merit Scholarship program. Long is following in the steps of his sister who was previously a National Merit Scholar. Long is undecided on college plans currently but hopes to continue playing football in college. “All I know is I want to be an engineer, so wherever that takes me and I can play football, that’s my goal,” said Long. About 90 percent of the Semifinalists are expected to attain finalist standing, and about half of the finalist will win a National Merit Scholarship, earning the prestigious Merit Scholar title. About 1.6 million students, in more than 22,000 high schools, entered the 2018 program by taking the 2016 Preliminary SAT/National Merit Scholarship Qualifying Test, which served as an initial screen of program entrants. The nationwide pool of Semifinalists, representing less than one percent of US high school seniors, includes the highest-scoring entrants in each state. To become a Finalist, the Semifinalist must have an outstanding academic record through-out high school, be endorsed and recommended by a high school official, write an essay and earn SAT scores that confirm the student’s earlier performance on qualifying test. National Merit Scholarship winners will be announced in April.